Are you shopping for Bluetooth earmuffs but with the number of options you aren’t sure which one to get? Then you’ve arrived at the right place as in this buyer’s guide you’ll find 7 of the best Bluetooth earmuffs available. We have done all the hard work for you by researching the best options based on customer reviews, quality of features, and brand. This buyer’s guide will save you time as you don’t have to go through hundreds of options to find the best ones. We have also included a buying consideration section for buyers that have never come across Bluetooth earmuffs in the past. This allows you to figure out the most important aspects of buying Bluetooth Earmuffs so that you’re able to make an informed decision. The factors we cover include audio quality, comfort, brand, durability, and wireless connectivity. Take the time to consider each of these aspects to increase your chances of ending up with the earmuffs that makes sense for your needs. We have a great time writing this buyer’s guide and hope you learn a lot. We are confident that by the time you finish reading to the end you’ll learn what’s required to make an informed buying decision. Good noise reduction and great durability against knocks and dust. Good quality microphone and long battery life of 16 hours. Long battery life and good mic implementation. Headband: the headband should have plenty of padding on the underside to ensure a comfortable fit on the top of your head. It should also be highly adjustable to it can be reduced or increased based on the size of your head. Earcups: the earcups must be large enough to fit your entire ear for long lasting comfort. You’ll notice the bulky nature of the earcups in this buyer’s guide. In part that’s because extra padding is required for noise reduction to be effective. Weight: working with heavy earmuffs all day can be a cumbersome experience if they are heavy. Fortunately, some brands in this buyer’s guide have used lightweight materials that helps keep the weight down. Read up on unknown brands to avoid nasty surprises after purchase. Background research on a brand can reveal info such as the quality of the customer service department, product durability, and signature features. Also read customer reviews to figure out the potential drawbacks that can be expected. There are a few notable brands in this buyer’s guide that you might have come across before. Buying from these key industry players means you’ll have a well-executed pair of earmuffs. It’s also a good idea to look for brand specific features that add unique value to the earmuffs. This might be the execution of the ergonomic comfort or the visual appearance. Frequency response: aim for a frequency response of 20-20,000Hz because this is the range the human ear can hear. Bass will be improved if the range is extended at the bottom end. Strong bass leads to impactful music that makes the most of genres like rock, hip-hop, and dance. Bluetooth version: note the Bluetooth version to determine audio consistency. The earmuffs should have Bluetooth 4x to ensure audio hiccups and outages do not occur frequently. Audio drivers: pay attention to the audio driver implementation in the product description. They are measured in mm and at least 40mm is ideal for an impactful audio experience. The materials used to manufacture the audio drivers also determine the audio quality and durability. The majority of earmuffs in this buyer’s guide are suitable for work which means they are very durable. Most earmuffs in this guide are well-executed as tough materials are used. Dropping the earmuffs should not damage them easily and they are also protected against dust. This is an ideal combination when working outdoors. There is a lack of waterproof protection so make sure to not use them in heavy rain. This is an oversight by the key players in this niche of products because adding a layer of waterproof protection would greatly improve the functionality. Furthermore, take a peek at the warranty deal to figure out how much faith the brand has in their earmuffs. A warranty deal with multiple years that covers many damage types is ideal. Battery life: the battery time per charge determines how much battery maintenance is required. Also the battery time depends on how you use the earmuffs. You’ll achieve extra battery life if you mostly use the earmuffs for the noise reduction functionality. Bluetooth version: in this buyer’s guide you’ll find earmuffs with Bluetooth 4x, which means you’ll enjoy a range of 33 feet and consistent audio quality. However, make sure to always note the specific Bluetooth version when investing in wireless earmuffs. Rechargeable battery: not all earmuffs come with a rechargeable battery, which means you’ll need to use AA/AAA batteries to power the earmuffs. This is a disadvantage because you’ll need to constantly buy more batteries, which overtime increases the operating costs. Are you on a tight budget and are after reliable Bluetooth Earmuffs that are durable and comfortable? Then you’ll love the offerings presented in this price bracket. The value for money here is impressive since a bunch of features are included without charging a premium price. The design allows for strong durability so you won’t have to buy a replacement pair of earmuffs in the near future. However, the audio quality in this price bracket is not competitive. You need to buy these earmuffs with the expectations that you aren’t going to be blow away by the audio fidelity. The Connex Bluetooth headphones have the practical combination of ear protection and Bluetooth connectivity. Therefore, you can work in loud environments and listen to audio via your smartphone. They have a bunch of work-friendly features that contribute efficiency and a safe working environment. However, you’ll need to evaluate the features to figure out if the value for money is acceptable. AAA batteries must be used to power the wireless connectivity, which is one of the big drawbacks here. It means you constantly need to buy batteries, which increases the cost of using these earmuffs. However, you get about 60 hours of use per set of batteries so you won’t have to replace them every day. The specific batteries used will determine the amount of battery life you’ll receive in practice. You can also invest in rechargeable AAA batteries so that you can conveniently charge them overnight once they have run out. The intelligent microphone controls allows you to take calls while working. They are ergonomically placed on the earcups which means the learning curve is very small. The buttons are relatively big so you won’t have trouble finding them with the tips of your fingers. The Bluetooth connection allows you to enjoy audio up to 30 feet away from the audio emitting device. That means you do not need to have the smartphone in our pocket to receive calls and enjoy music. The noise reduction is a solid 25 decibels and the audio within the earcups is limited to 84 decibels. This level of noise reduction ensures your ears are protected for very loud noises that would otherwise lead to a ringing sound in your ears. The comfort with these headphones is excellent due to the large over-ear earcups that allows your ears to fit inside. They provide a firm and secure fit that doesn’t come loose when moving your head. Therefore, you can work with these earmuffs without feeling like you need to constantly adjust the fit. The headband has some padding on the underside, but not an extensive amount. These earmuffs do not have a premium feel, but the materials allow for excellent durability. Therefore, you can drop them a few times without worrying that the audio drivers will be instantly damaged. Also there is good dust protection, which means working with them in dirty environments is not a problem. To conclude, the CONNEX Bluetooth is a good choice for buyers that need good protection for their ears while enjoying music and taking calls. The combination of solid durability and 60 hour battery life means you can work uninterrupted on a daily basis. 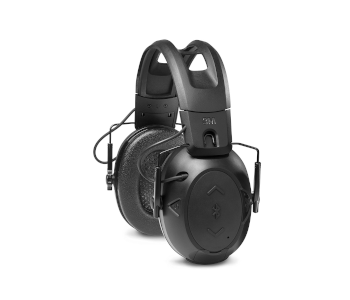 The 3M WorkTunes are highly rated earmuffs that are ergonomically design. You’ll love the combination of strong durability and the reliability of the Bluetooth connection. 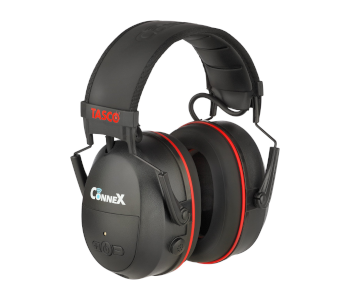 They are suitable for use at work in noisy environments to listen to music or take calls. 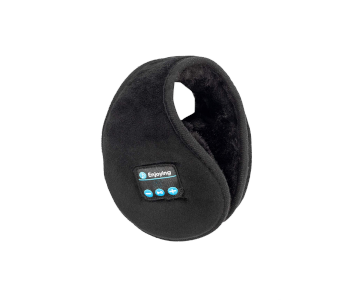 The versatility of these earmuffs is excellent due to the strength of the implementation. Take a closer peek at the features implemented to figure out if these earmuffs will get the job done for your needs. The noise reduction rating here is 24 decibels, which means the majority of ambient sounds are eliminated. However, very loud sounds will still be heard, but at a noticeably lower decibel level. So your ears are protected from damage and you can enjoy a wireless Bluetooth connection at the same time. The integrated microphone allows you to take calls without the need to remove the earmuffs. Since the noise isolation is excellent you’ll be able to clearly hear the person at the other end of the call. However, the microphone quality in the 3M WorkTunes is nothing special. 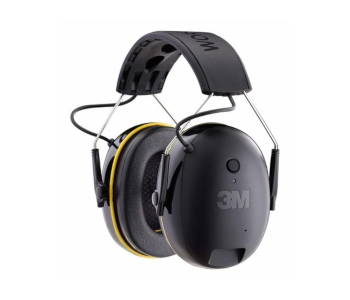 The 3M WorkTunes are great if you work in a noisy environment but need to handle incoming work calls. The durability here is impressive since they are built for work environments. 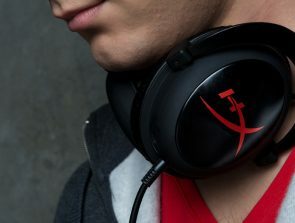 You can drop them without fear of damaging the audio drivers and there is decent protection from dust/dirt. However, there is no waterproof protection that allows you to be protected from the weather. Large 40mm audio drivers are implemented that delivers decent audio quality for the duration of the 8 hour battery life. The battery can be charged via a USB cord, which means you’ll find plenty of places to charge the headphones. However, if you decide to work longer than 8 hours this battery life might be limiting, so you’ll need to invest in two pairs of these headphones. The 3M WorkTunes have a lot of upside, but for a balanced overview you need to consider some of the drawbacks. They are relatively heavy and bulky so you’ll need to get used to the fit. Also there could be better on-ear controls to give you more functionality while working. To summarize, the 3M WorkTunes are great if you need noise reduction with a personal audio solution that works via Bluetooth. The mix of the 8 hour battery life, durability, decent microphone, and high buyer ratings means you’ll be making a smart investment. These earmuffs have the dual functionality of keeping your ears warm and reducing ambient noise. They are priced at the budget end of the scale and can be very useful depending on where you live. Those living in climates with cold winter should make this investment if they want to enjoy music while wearing warm earmuffs at the same time. The combination of the low cost and excellent reviews means these earmuffs are a no-brainer. However, don’t take our word for it, take a closer look at the features to determine if these earmuffs match your requirements. The Bluetooth 4.2 implementation means you’ll achieve 33 feet worth of range from the audio emitting device. Therefore, the smartphone can be at a distance as you walk around in the vicinity. The battery life is 8-10 hours per charge and the standby time is 350 hours. Therefore, you can leave the earmuffs lying around for days without running out of power. The soft and thick fabric is designed to keep your ears warm during winter months. Wearing traditional headphones when the temperature drops can be lead to a very cold experience. These earmuffs are an alternative that allows you to enjoy a personal audio solution out in the cold. However, the audio drivers here are no match for the regular headphone marketplace. Furthermore, they are light at just 4 ounces so you’ll hardly feel they are there after a short period of wearing time. Convenient buttons on the right side are added that allow you to pause/play the music and alter the volume. However, there is no microphone here so you can’t accept calls. Therefore, you’ll need to get your smartphone out in the cold, which can be frustrating. This oversight by the manufacturer can be avoided in future upgrades of these earmuffs. They are compact and portable, which means take them wherever you go. Fit them in the pocket of your winter coat when you have finished using the earmuffs. The materials are also durable, but not waterproof so you’ll need to take care in the rain or heavy snow. They are suitable for men, women, and kids so the entire family can enjoy using these earmuffs during the winter. To summarize, they are the right choice for buyers that need a personal audio solution in the cold. The mixture of the up to date Bluetooth 4.2 connection, decent battery life, and practical design means you’re getting an ergonomic pair of earmuffs. However, the lack of a microphone might be a deal breaker depending on your preferences. 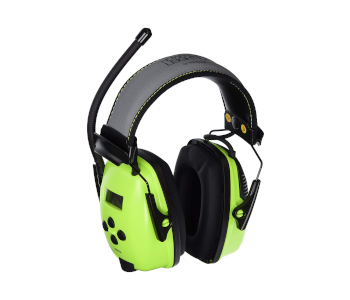 Are you after highly visible earmuffs that are suitable for the work environment? Then you’ll be pleased with the Howard Leight by Honeywell that are packed full of work friendly features. This is a special entry because they do not have Bluetooth capability. These earmuffs make it onto this list due to the useful nature for work based environments. They are highly rated and offer good value for money. However, look at the features in more depth to determine if they match your needs. A digital FM/AM radio is included that allows you to tune into local radio station. The receiver isn’t the best, but you’ll be able to hear radio stations well enough for talk based programs. The audio fidelity of music might not be as clean as you’d like, but good enough if your standards aren’t high. There is functionality to create 10 present stations so you can quickly toggle between them while working. The bright green earcups means you’ll be highly visible from a distance. This improves safety when working in hazardous environment such as on a busy motorway or a construction site. The earcups also have plenty of soft padding to provide long lasting wearing comfort. The large size is bulky, but it’s required to allow the entire ear to fit inside. The headband has a durable leather design, but the lack of padding on the underside means comfort is somewhat sacrificed. A maximum of 25 decibels are reduced by the noise reduction system that keeps your ears safe from loud sounds. These earmuffs are recommended in industries such as aviation, law enforcement, construction, farming, transportation, lumber, and steel. The stereo sound implemented here is good compared with other earmuffs. You’ll like the clarity of calls since you’ll clearly hear the person at the other end of the line. The noise reduction technology means you can be in the middle of a very noisy environment and take calls without having to find a quiet room. Furthermore, the microphone is clear so the other person can hear you too. However, it doesn’t do a good job of canceling out ambient noise. 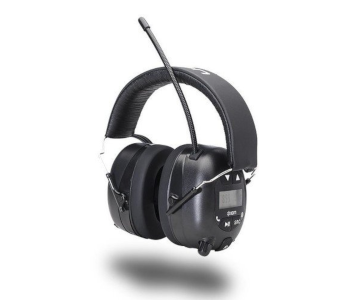 To conclude, the Howard Leight by Honeywell is a well-engineered pair of earmuffs suitable for a number of industries. The bright design means you’ll stand out at a distance, which will keep you safe. The implementation of the microphone, audio, and durability is competitive here so the purchase is worth the asking price. This price bracket is ideal for buyers that are after extra performance and have the budget to pay for it. The overall durability and reliability is improved here with an added focus on long battery life. These earmuffs are great for a number of industries, which includes lumber, steel, construction, aviation, highway repair, and law enforcement. However, the higher price tag means you’ll need to scrutinize the list of features more intensely to figure out if the asking price is justified. Also keep in mind if the added quality is worth the extra cost given your intended use. The Peltor Sport Tactical 500 is ergonomically designed for superb comfort and functionality while hunting. The versatility here is great, which means you can use these for a wide range of uses such as construction work. These earmuffs are one of the most expensive in this buyer’s guide so you’ll need to decide if the quality implemented is worth the asking price. The earmuffs reduce noise by up to 26 decibels so that very loud noises don’t harm your ears. They are designed to avoid ear damage for gunfire. Therefore, you can trust these earmuffs to handle other sounds with ease. The large earcups with soft padding means the touch on the skin is pleasant allowing for long wearing sessions. They are also foldable so you can reduce the bulky earmuffs down the size for easier storage. The headband has no padding on the underside, but there are gaps for excellent ventilation. Overall, lightweight materials are used to reduce the weight down so the wearing experience is not cumbersome. The Bluetooth connection runs on 2 AA batteries that are not included in the package. At this steep price the manufacturer could have included the batteries to add extra value and avoid frustration. The estimated battery life is around 40-90 hours, and it depends on how you make use of the earmuffs. Furthermore, the specific batteries used also plays a big role in determining battery life. A retractable durable microphone is added that picks up vocals with a high degree of clarity. Also wind and fan noise is reduced so the recipient at the other end of the call can hear you well. Therefore, these earmuffs are ideal for taking regular calls while hunting or working. To summarize, the Peltor Sport Tactical 500 is the right choice for buyers that demand high-performance and have a sizeable budget. The combination of a comfortable fit, great mic implementation, and long battery life means they are worth the asking price. 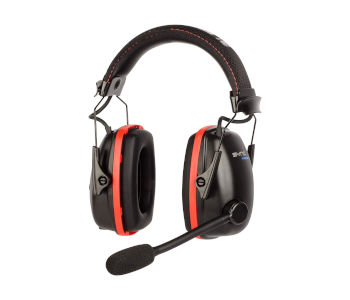 The Honeywell Sync Earmuffs are highly rated due to the excellent implementation of practical features. Visually they look durable and you’ll get the same feeling when holding them in-hand. They are intended for the worker that needs noise reduction and a wireless audio solution that allows music to be enjoyed. Before coming to a decision take the time to carefully look at the features. Bluetooth 4.1 is implemented here that provides a connectivity range of 33 feet and stable audio. Call quality is reliable because this Bluetooth version doesn’t suffer from regular audio hiccups like pervious versions did. The battery life is 16 hours so you can work for two full days before needing to recharge. 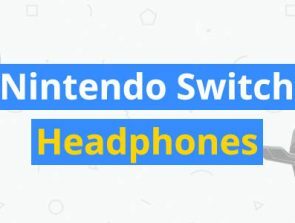 Furthermore, the 3.5mm audio port is added for a wired connection when the battery life has run out. The headband and large earcups are extensively cushioned to allow for long wearing sessions. Also the use of lightweight materials means the overall weight is lower than what you might think from looking at the pictures. 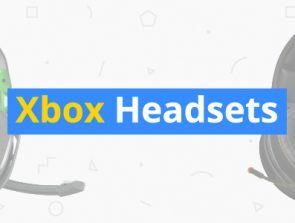 Finally, the earcups are large enough for your entire ear to conveniently fit inside. Patented Air Flow Control Technology reliably reduces the volume by 25 decibels. Furthermore, the audio drivers are limited to 85 decibels allowing you to protect your ears from damage when working all day. This combination means you can wear the Honeywell Sync all day throughout the year without your ears suffering from damage. The mic is implemented on an adjustable boom that adds more bulk to the overall design. This might not be ideal when working in certain environments such as a construction site because the mic can get damaged. However, the mic quality is drastically improved with such a design, so if voice communication is a priority this design is a good choice. To summarize, the Honeywell Sync is great for buyers that want strong durability, a clear microphone, good comfort, and effective noise reduction. The 16 hour battery means you can work for days without recharging and you’ll love the durable feel in-hand. The ION Audio Tough Sounds earmuffs are packed with practical features that enable you to work while enjoying a personal audio solution. The durable design is ideal in harsh work environments that would typically damage other headphones. The noise reduction works as described and they come at a reasonable price. Delve deeper into the features offered to figure out if these earmuffs are the right choice for your needs. These ION earmuffs provide up to 25 decibels worth of noise reduction, which means your eardrums are protected from potentially harmful sounds. Invest in these earmuffs if at work you get have a ringing sensation in your ears due to heavy machinery. Light materials are used to keep the weight down, which means the bulky look is somewhat misleading. Therefore, you won’t feel like these earmuffs are cumbersome to wear for long periods of time. You’ll have 20 hours of battery life per charge, which means there is no need to constantly recharge the headphones. The battery can be rechargeable via USB so there is no excuse for not finding a compatible source of power. A built-in microphone is added that allows you to communicate while working. Therefore, you don’t have to take off the earmuffs to answers calls. This leads to a more efficient work environment – especially if you need to take work calls throughout the day. The added AM/FM radio adds even more versatility to the listening experience. Toggle through the radio stations if you don’t want to link the earmuffs up to your smartphone for audio. 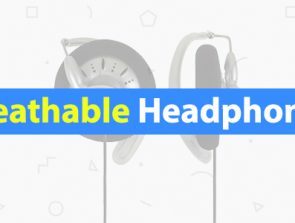 This means you can go to work and quickly listen to music without the hassle of loading up a playlist. Consider a few of the disadvantages of the ION Audio Tough Sounds earmuffs before adding them to the shopping basket. Firstly, the overall audio quality could be better for the price bracket. You won’t be impressed by the balance across the frequency range. Also the radio reception can sometimes be sketchy, which can lead to a frustrating listening experience. To summarize, the ION Audio Tough Sounds earmuffs are a good choice for buyers that want the combination of a secure fit, radio, long battery life, and durability. You’ll instantly notice that the manufacturer has made an effort to think about the end user. However, be prepared to deal with sub-par audio quality as the drivers are not sophisticated.